We are engrossed in presenting an extensive assortment of Polypropylene Diaphragm Valve to our clients. 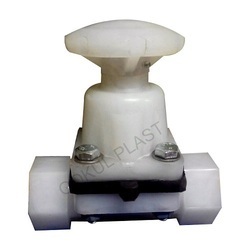 Being a foremost organization in the industry, we are actively engaged in manufacturing the best quality range of PP Diaphragm Screwed End Valve. Valve Size (milimetre): 1"- 8"
Our firm is a trustworthy enterprise, engaged in offering excellent quality Diaphragm Valve. We offer PP Diaphragm Valve Flange Endto our clients. We are engaged in providing a wide range of PP Diaphragm Ball Valve to our clients. We are highly engaged in offering a wide range of premium quality PP Diaphragm Valve. The offered diaphragm valve is usually used to regulate as well as block liquid flow and is widely used in water and effluent treatment plant, desalination plant, power plant and chemicals plant. 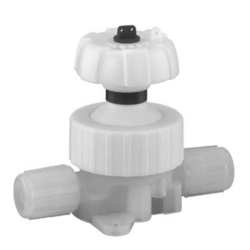 This valve provides an excellent flow control. PP Diaphragm Ball Valve, Size: 1/2" To 4"
As an affluent name of this domain, we hold expertise in providing high quality PP Diaphragm Ball Valve. Connection End: Flanged as per ANSI B 16.5 (150#) & BS 10 (Table D/E/F) & DIN STD.